The children have had a great time today, learning about life at Burbage School in the 1960s. We welcomed former staff and pupils to have a tour of school and see how much has changed since they last visited. 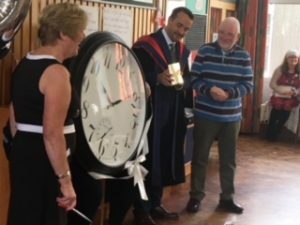 The PTFA very kindly funded an outdoor clock and plaque to commemorate the 50th anniversary. This was presented to the school during assembly by Mrs Elliott, our longest serving member of staff (35 years!) and Mr Thompson who was one of the builders who built the original school building in 1968.